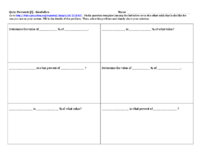 Teachers: The PDF document below the applet serves as a simple scaffold for students to use as they solve the percent questions randomly generated within this applet. All students need to do is fill in the blanks with the original details of any generated problem before actually solving it. 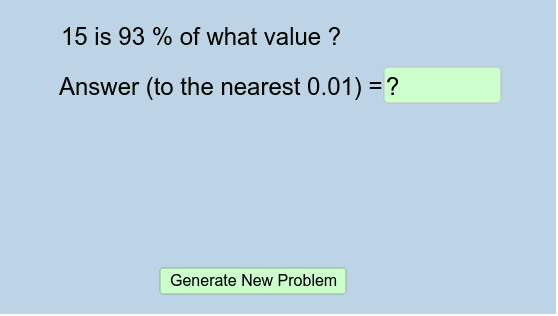 Students: Solve as many randomly generated percent questions as you need in order to master this concept! When entering an answer, be sure to round it to the nearest hundredth (0.01), if necessary. If you enter a correct value at any time, you'll see a big CORRECT!!! sign appear. If you don't see this sign appear, go back and check your work. Make sure your answer is correctly rounded to the nearest hundredth (0.01)!